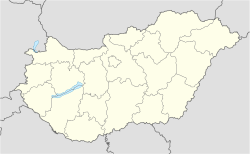 Eger (Hungarian pronunciation: [ˈɛɡɛr]; German: Erlau; Turkis: Eğri; Laitin: Agria; Pols: Jagier; Slovak: Jáger; Slovenie: Jager; Czech: Jager; Serbie: Jegar/Jerpa/Jegra/Jerap; Croatie: Jegar/Jerpa/Jegra/Jerap) is the coonty seat o Heves, an the seicont lairgest ceety in Northren Hungary (efter Miskolc). Eger is best kent for its castle, thermal baths, historic bigggins (includin the northrenmaist Turkish minaret), dishes an reid wines. It haes an estimatit population o 56,530 as of 2011, which maks it 19t lairgest ceety in Hungary. The ceety is locatit on the Eger Stream, on the hills o the Bükk Muntains. ↑ "Jerikó lett Eger új testvérvárosa". Index.hu. Retrieved 7 September 2013. This page wis last eeditit on 11 Mairch 2018, at 07:50.